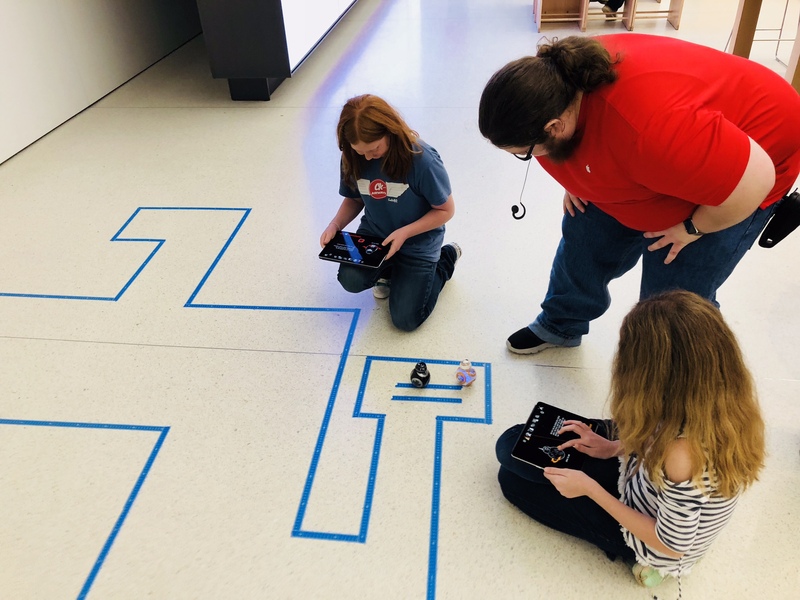 I wrote about Apple’s Hour of Code events a few weeks ago when they announced their expanded slate of classes in celebration of Computer Science Education Week. 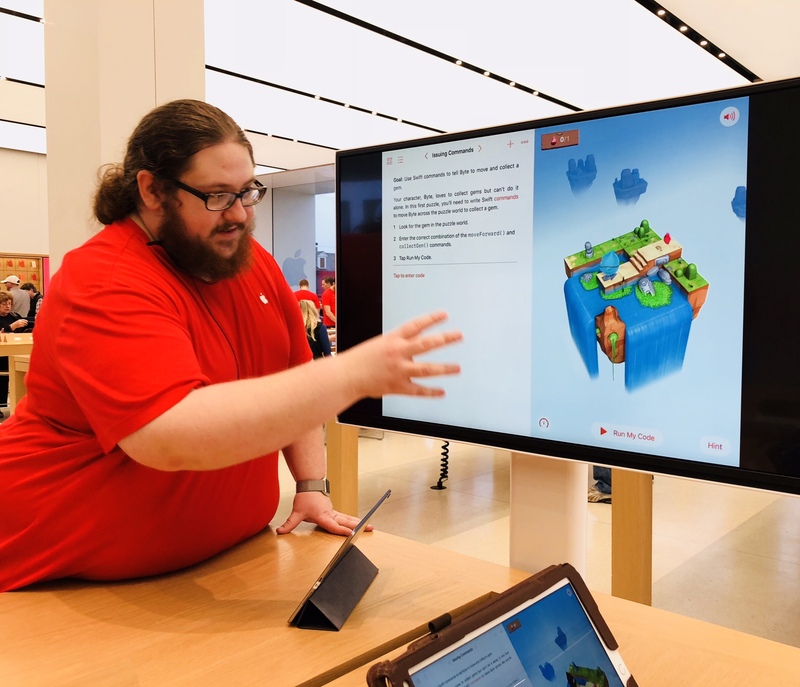 While coding class classes dominated the schedule during that week, including a couple geared specifically toward teachers, the Hour of Code How to Get Started with Coding and a couple of Kids Hour classes are still part of the running agenda at the Apple Store in Germantown, TN. While I intended to take my kids to a couple of classes the weekend after I wrote that original article, the timing just didn’t work out. However, my daughter and I were able to finally able to make one yesterday. She had a friend staying over with us thanks to school being out for Christmas Break, so she came with us as well. Thanks to a heavy downpour, we ended up being the only ones in the class, which actually turned out great. I brought my current iPad Pro and my old one that my family now uses along with Swift Playgrounds loaded up in advance so the girls would be able to use them. Since there wasn’t anyone else, I was able to join in the class exercises using one of the store’s iPads. Even though I found the concept intriguing when Apple released it, I’ve never spent too much time messing with Swift Playgrounds. I program and mess with controls all day, so playing coding games never struck me as being very appealing. I’ve recommended it to my kids, but they didn’t show much interest until going to this class. Some people are good with jumping right in and learning new things on their own, and Swift Playgrounds does a solid job of easing new users in and getting them moving at their own pace. However, some people are less willing to jump right in. This How to Get Started with Coding class is for those who don’t feel as comfortable with new concepts without that initial introduction. Tony was our teacher for the class, and he did a really good job of covering several key lessons in Swift Playgrounds in a very friendly and approachable way. He helped my daughter and her friend whenever they had questions, was engaging, and generally just did a very good job of presenting topics that can seem overwhelming in a non-threatening way. Based on his performance, I have to complement Apple on how they train their in-house class teachers. It is very clear that they are doing a very good job of preparing them, as everything was quite smooth and organized. When the class material was wrapped up, Tony took the time to stick around and talk with us for a bit about questions we had, different programming languages, and other good apps to try. Then he mentioned the Kids Hour classes, which focus on programming robots, like Sphero’s R2-D2 and BB-8, and asked my daughter and her friend if they would like to see them. You can guess what their answer was. Tony came back with R2-D2, BB-8, and BB-9, and took the time to demo the Sphero app and how they work. There was a “track” made with tape on the floor in the corner next to our table, which was out of the way of customers walking around. It was there for the Kids Hour classes that focus on controlling and programming these robots. He let the girls take the the two BBs over there and play with them. He stuck around for another five minutes or so, which was already a good 15 minutes past the end of the class time, helping the girls with any questions they had about how to control the little robots. Then, he left them and the two iPads with us, saying that they could stick around and play with them as long as they wanted. We spent the next 20 minutes having a great time playing with these really cool little robots, as several people came up, asked questions, and took turns with us, as well. This last bit really won me over. No one was watching a clock. No one suspected we would head for the door with a $130 robot or $600 iPad Pro in hand. This class turned into something even more fun than I expected, and it really had a positive impact on my daughter and her friend. They had a blast, and kept on playing coding and puzzle games in the car ride to lunch and after we returned home later. This is the kind of service that sets the Apple Store apart from other retailers, and it’s a big reason why they are always full of people, no matter what time of year it is. I can’t say what the future will hold for my daughter, but this class seemed like it sparked an interest. I’ve always known that she has a high degree of aptitude in math and puzzle-solving. She is also highly adept a designing elaborate structures in Minecraft and other such creative games. She took to Swift Playgrounds quickly and easily, and actually ended up downloading and playing with some other coding games on the iPad after we got home. Her friend was also hooked, because she texted us asking for the names of the apps they had been playing after she went home. 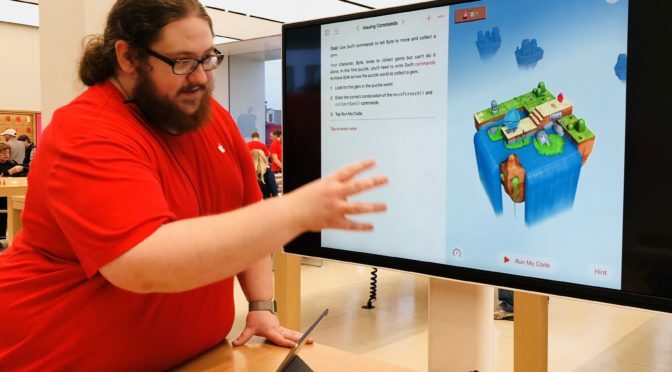 I know that Apple offers a wide variety of classes in their Stores, and that the How to Get Started with Coding is just one of many different kinds. Based on my experience, and that of my daughter and her friend, I would highly recommend taking any class that you may be interested in there. Based simply on Tony’s preparation and knowledge of the material and the overall organization of this coding class, I can see the amount of the effort and investment that Apple puts into them. As for the How to Get Started with Coding class specifically, I would highly recommend it if you have a child with an interest in programming, or one like my daughter who has a high degree of interest or aptitude in parallel subjects. The class description says it is geared toward ages 8 and up, but I would say it is probably more suitable for 10 and up. That’s more because it moves at a fairly brisk pace. If you have younger kids, the Kids Hour classes that focus on the robots may be a little more approachable. Either way, they are a great, low pressure introduction to the world of coding that can be followed up with Apple’s very useful and interesting Swift Playgrounds app. Have you taken a class at an Apple Store? Have you taken a coding class, specifically? If so, I am interested to know what your experience was like, positive or negative. Let me know in the Comments section below, on Flipboard, on our Facebook page, or on Twitter @iPadInsightBlog.